Instructions for making ming trees and bead flowers. 1985. Published is 1929 this is the oldest beaded flower book I know of. 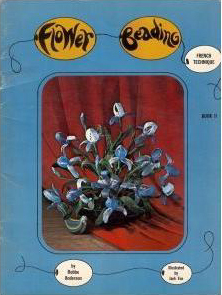 The front cover of this 16 page pamhplet states "Featuring the Latest Models From Paris, with Instructions for Making." Contains instructions for Tiger Lily, Canterberry Bell, Fleur de Jeur, Wild Flower, Bunchberry, Blossom Vine, Oriental Cluster, Crystal Tree, Azalia Tree, Wild Rose, Sundrop, Robin's Plantain, Wild Carrot, Crystal Sweetbriar, Bead Spikenard, and Apple Blossom.